I bought the StudioPress Genesis Theme Framework (affiliate link) based on advice from my good friend Chris Brogan to upgrade my blog. I was so fascinated by it I have clearly moved most of my clients and my blogs (Veglatino, Twitpuerto, Raúl Colón’s Blog (This Blog), and PapaHeroes). One of the reasons I moved my blogs to WordPress from Drupal was the huge learning curve Drupal brings upon anyone willing to understand it. Although it is more flexible I really did not think my blog was optimized for SEO and all the goodies the StudioPress Genesis Theme Framework brings for WordPress. Many months after moving into WordPress I have seen an improvement in visitors finding my content via search engines. A good example is a post on the broken screen of my iPad 2. People come in every day from various search engines (mostly Google) with keywords related to IPad Broken screen. Another good example of using the StudioPress Genesis Theme Framework was a few months ago where I set up Romybaez.com for a client and friend. He decided to increase his online presence online so he could sell his insurance services so we set up a website with a blog. The unique part was that in his Bio we explained that he was the ex-owner of a very well known restaurant in my hometown of Ponce. Since that restaurant does not have a website we received traffic of people searching for the restaurant into his website. Given that in his line of work trust is key (like in many others), I am more than sure that people that know him because of the restaurant might be interested in learning more about his services and what he is doing now. I really think that the configuration of Genesis Theme Framework does give us many advantages but personally I have to say that the fact that I can learn a lot quicker has increased my abilities into customizing and understanding WordPress overall. Over a Week ago we launched Foodtruckfreak.com a project to help individuals in Chicago find their favorite Food Trucks. Running this project and building it on the Genesis Framework has helped me understand many things that I did not understand from WordPress before. Although every project for me no matter how small will be a constant work in progress. StudioPress Genesis Theme Framework has given me back time I use to spend coding and developing by giving me a solid framework that helps me not to re-creating the wheel. The time I use to spend coding now I use for better planning and more enhance site functionality. If you are planning to move your site to WordPress and feel uncomfortable and unfamiliar with WordPress, I highly recommend you making your move with a framework like StudioPress Genesis Theme Framework . 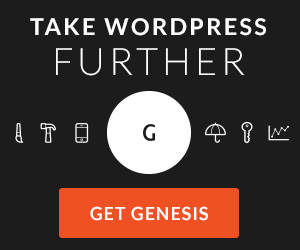 I knew very little of wordpress when I moved over and I can’t think of any other easier way than using Genesis. If you are interested in learning more about StudioPress Genesis Theme Framework feel free to click the images and if you do buy any of the templates I get a Commission as an affiliate.